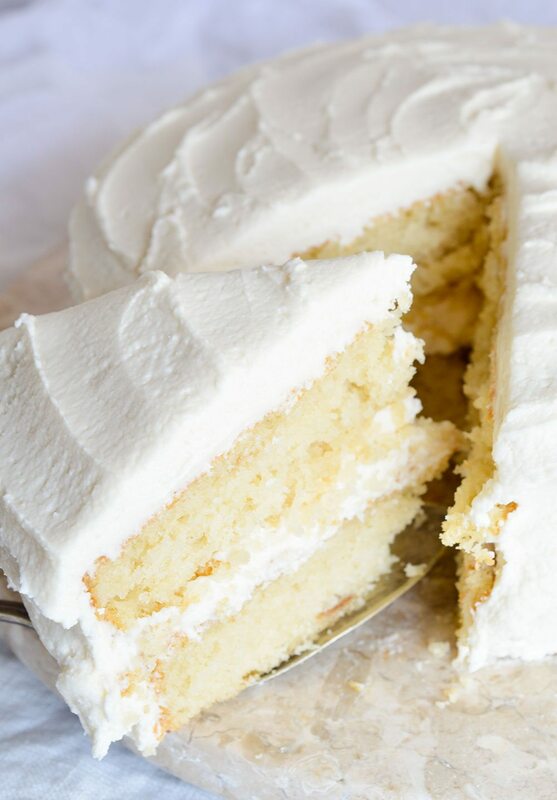 Bake a cake just like Grandma used to with this Vintage Buttermilk Vanilla Cake Recipe From Scratch. 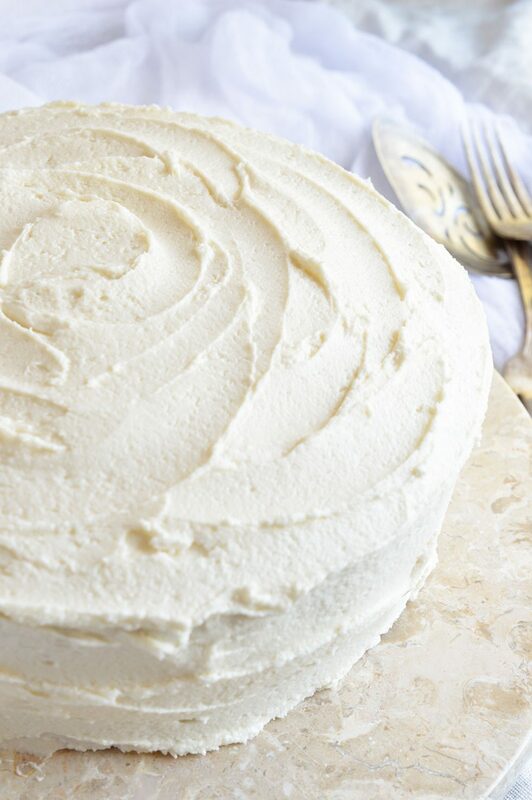 A delicate layer cake topped with homemade vanilla buttercream frosting! Would my Grandma approve of this generation of convenience cooking? 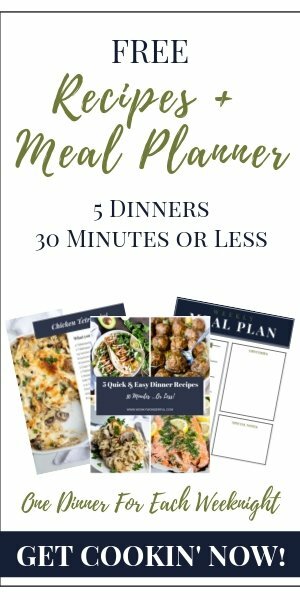 She had 5 kids, of course she would take advantage of quick and easy recipes. So long as it still tasted good. I’m positive my Grandma would still make her cakes from scratch. Does boxed cake mix taste good? Sure it does. 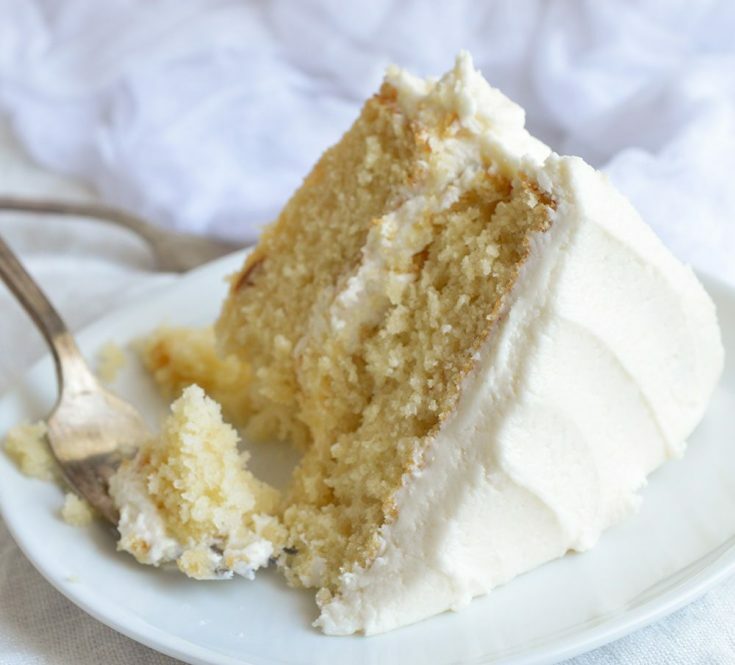 But, do you know what tastes better?… This Buttermilk Vanilla Cake Recipe From Scratch. I consciously kept this cake plain. First, I wanted the vanilla flavor to shine. Second, this cake can be enjoyed as is. Or dress it up however you want. Top with fresh fruit, edible flowers or sprinkles. This cake is the perfect starting point for your unique creation. 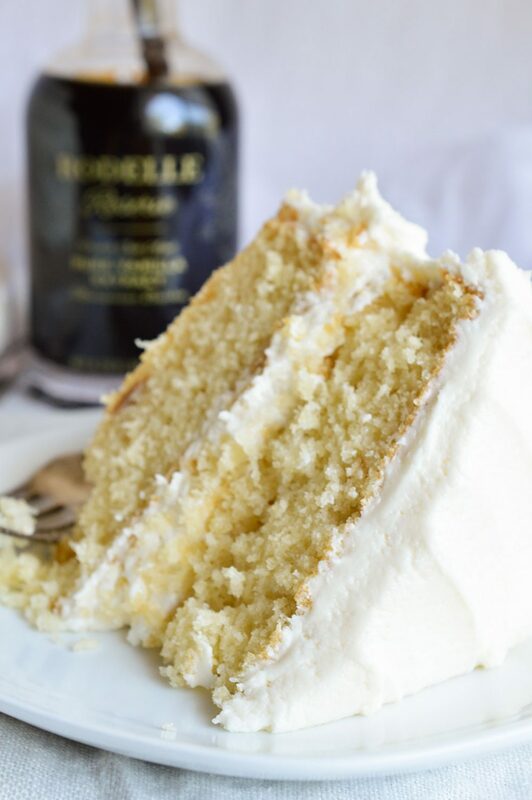 I wanted to highlight Rodelle Reserve Vanilla in a classic recipe for the modern day. 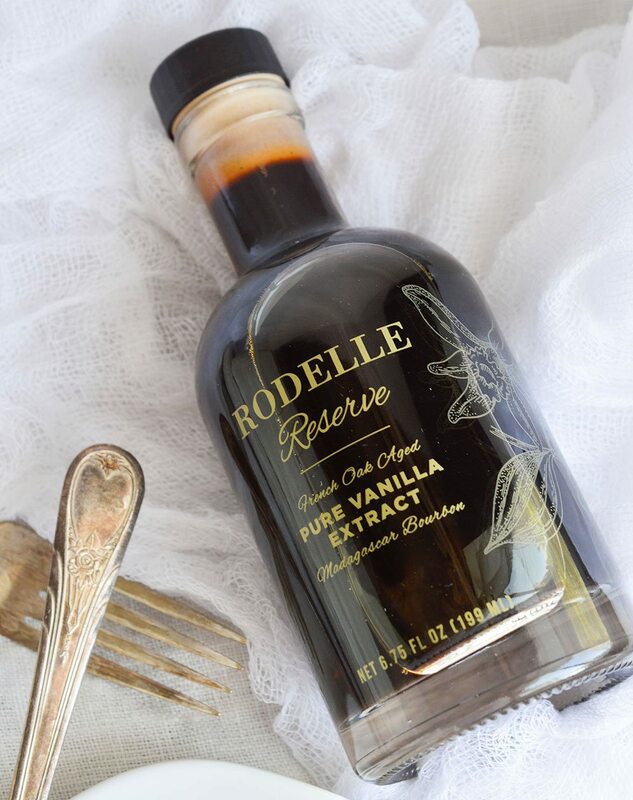 Rodelle Reserve uses the best in historical techniques and modern technology to make the best vanilla available with the purest of ingredients and a vintage feel. Sometimes it is worth a little extra time and effort to get the best. 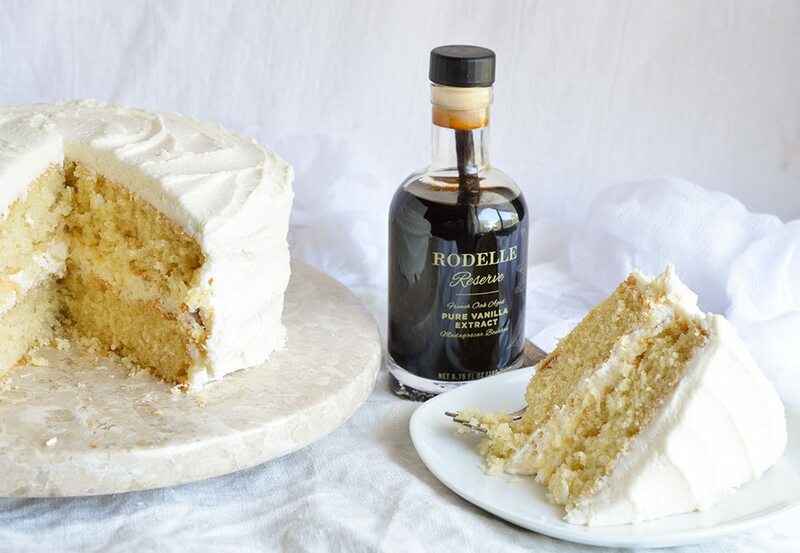 Rodelle Reserve was aged for 6 months in French Oak barrels to enrich the vanilla flavors and soften the harsher alcohol flavor that all extracts inherently have. 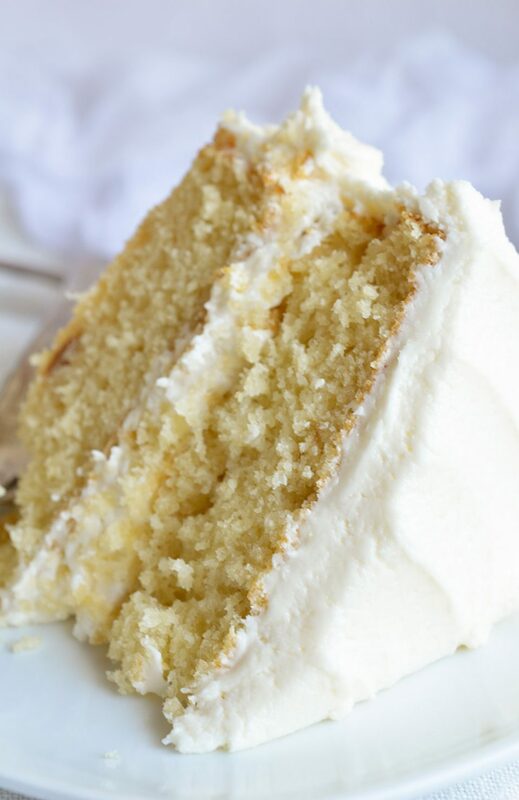 This cake is timeless but will not take you all day to make! Get your bottle of Rodelle Reserve now! Only 1600 bottle are available! The imported Italian bottles were screen printed, and each bottle contains a gourmet Madagascar Bourbon Vanilla Bean. No one bottle will ever be the same! So this one’s for Grandma. I think she would approve. 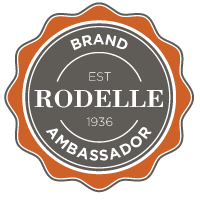 I am proud to be a brand ambassador partner with Rodelle. I receive free product as part of my brand ambassadorship. All opinions are 100% genuine. I made this cake it was delicious but the first set of cakes didn’t rise were likeFrisbees. I figured out my baking powder was expired. Went & bought new baking powder tried baking them again this time they did rise. I did have to add more buttermilk to the frosting 1 tablespoon at a time till I got the consistency that I liked. I will definitely make this again. Oh no! I hate when that happens. I’m glad the second go around worked out. I made this cake and the batter was wonderful…however I put them in 8 inch pans and they hardly rose. My ingredients were all fresh including the baking powder. I read somewhere below in the comments that someone else had them only raise to an inch. I am an experienced baker – I am a bit disappointed. How high are these layers each supposed to be? Hopefully, it will taste fine but with 3 teaspoons baking powder I am a bit surprised. Hello! Does the butter need to be at room temp for the cake? I was surprised it didn’t note in tv’s recipe that it should be softened. What a wonderful cake recipe. I made it with my family’s caramel frosting and it was devine. I’ll definitely make it again! The recipe didn’t note to soften the butter for the cake, but I did. I assume it’s supposed to be softened? hi, nicole i want to know if it is a 1 pound of cake, i need to make exactly 1 pound of cake and can i change the butter for oil? I have not weighed the cake. I doubt it is exactly 1 Lb though. And no, I would stick to butter. Perhaps a google search would bring you to a recipe for a 1 Lb cake…maybe. thanks you so much for the reply!!! I want to make this cake for my twin boys’ birthday – can I add cocoa to make a chocolate version so each boy has his own cake? If so what is recommended and how much. THANKS!! Hi Nicole I followed your recipe except for I used my favorite vanilla concentrate instead of the Rodelle vanilla. My cupcakes were delicious and rised perfectly. I filled the cupcake liners 3/4 full and the batter made 16 cupcakes. I baked them on the second to bottom lower rack in the oven for 18 minutes. 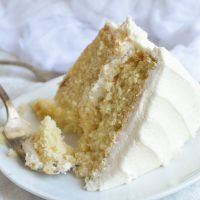 I usually always leave my ingredients out for about an hour or so so they’ll come to room temp before making any cake recipe this helps with texture an overall a better product so I’m wondering if some of the comments where the cakes are not rising is due to having to cold of ingredients. Thank you fo sharing your recipe. I’m definitely keeping this one. I’ve only made this as a two layer cake. You could double the recipe to have enough although there may be a little batter left over. I made this cake this morning with some adjustments out of necessity. My daughter-in-law is gluten intolerant so I subbed Robin Hood all purpose GF flour. I’ve found through a lot of trial and error…mostly error lol…that gluten free flours tend to soak up a lot more moisture than “normal” flours. I added only 1 1/2 cups of flour instead, going more on the texture of the batter to get it right. It didn’t rise much but that was probably my own fault, while I was measuring ingredients the phone rang (freaking telemarketers) and couldn’t remember if I had added 2 or 3 teaspoons of baking powder. Since I’m going to use this cake for a strawberry cheese cake trifle the density will probably be a bit better for it. What happens if I whipped the buttermilk before adding to mix? I have never whipped the buttermilk, so I’m not entirely sure. The cake did not rise properly for me. Perhaps an inch high at the edges, with a badly cracked peak in the center. The texture was too dense and gooey. I was doubtful from the start because this recipe calls for baking powder. Most buttermilk recipes use baking soda instead. I tried again, this time substituting 1 1/2 teaspoons of baking soda for the baking powder. It rose more like a normal cake, but still not as high and light as I would expect. I would love to try this cake for my grandsons birthday cake but I wanted to make it as a sheet cake which is 12x16x2 do I have to change the receipe amounts any help would be greatly appreciated. I have not made this as a sheet cake. There have been many commenters that have used a variety of different pans with success. I made this cake for my moms bday and she loved it! i used an alcohol free vanilla from trader joes that tasted just fine. i also added orange zest and orange juice into the frosting and put fresh raspberries in the middle and top layer. It tasted fantastic, the cake was moist and the buttermilk (i think) added a good flavor (im not paul hollywood tho so idk)! Is’n 6 cups of powered sugar alot for a 2 layer cake? Couldn’ I use maybe 4.5 or 5 cups. But if you think 6 cups want be too much frosting then I’ll use 6 because I do like a good bit of frosting. I just thought 6 cups would be WAY to much. Thanks. I also know if I lower the powered sugar in the frosting I will also lower the other ingredients in the frosting except the vanilla extract. I am going to use the new McCormick’s SMALL BATCH vanilla extract. Thanks. This recipe turned out great I used another reviewers suggestion for cupcakes and they came out tasting awesome with a really tender cake. I know we aren’t supposed to love box mix but box mix is flavorful and tender and not dry. This is even better. Only change I made was I added about a half teaspoon of almond extract. Thanks for this recipe truly delicious! Is this US measurements? I am in South Africa and would like to try this cake but but we use metrics and need to know if I should convert to metrics. I do not see the recipe, where is that located? Hi Curtis. Apologies, there was a major hack attack across the internet today. It caused havoc on many websites (including mine 😒) The issue has been corrected and the recipe is now back up. If you aren’t seeing it you may need to clear your browsing history. Sorry for the inconvenience. oh no worries! thank you for the quick fix!